NEW YORK, September 30. /TASS/. 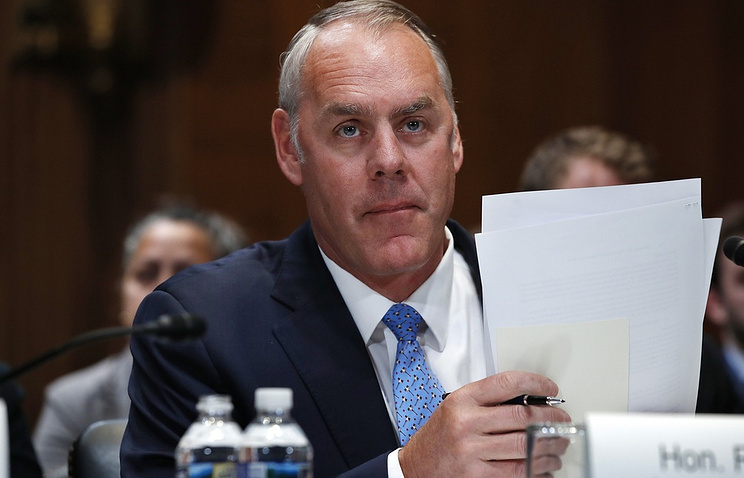 US Interior Secretary Ryan Zinke said a naval blockade of Russia was an option for limiting Russia’s role on the global energy market, Washington Examiner quoted him as saying. “The United States has that ability, with our Navy, to make sure the sea lanes are open, and, if necessary, to blockade … to make sure that their energy does not go to market,” Zinke was quoted as saying during an industry event in Pittsburgh hosted by the Consumer Energy Alliance. According to the paper, the minister said that the use of the hydraulic fracturing, or fracking, technology gave Washington an advantage over Russia and Iran because its reduced Washington’s dependence on foreign hydrocarbons. At the same time, Zinke said the Russian economy strongly relied on oil and gas revenues. “I believe the reason they are in the Middle East is they want to broker energy just like they do in eastern Europe, the southern belly of Europe,” he said. According to the Interior Secretary, Washington was also considering economic measures to put pressure on Russia and Iran in order to squeeze them out of the global energy market. “The economic option on Iran and Russia is, more or less, leveraging and replacing fuels,” Zinke said. “We can do that because … the United States is the largest producer of oil and gas.”. 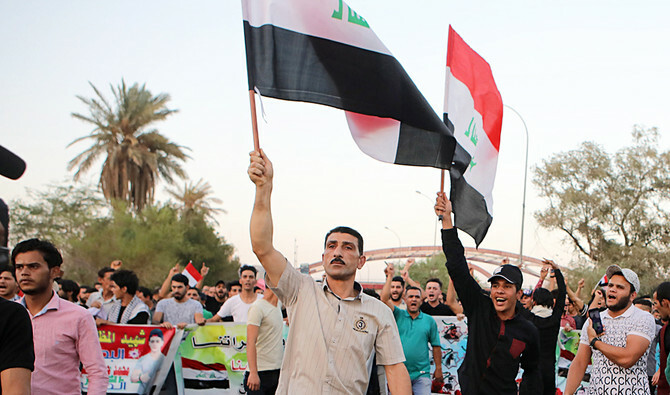 NEW YORK: The United States on Friday shut its consulate in the protest-hit southern Iraqi city of Basra, blaming “indirect fire” by Iran-backed forces and warning its rival of retaliation for any damage. Secretary of State Mike Pompeo ordered that all but emergency staff leave Basra, with consular duties to be taken over by the embassy in Baghdad. Basra has been rocked by weeks of demonstrations by Iraqis protesting unemployment and government inefficiency in the oil-rich south. Pompeo, who has made rolling back Iranian influence in the region a top priority, blamed militias linked to Iran’s elite Revolutionary Guards for “indirect fire” — which usually means rockets or artillery — against the US consulate. “I have advised the government of Iran that the United States will hold Iran directly responsible for any harm to Americans or to our diplomatic facilities in Iraq or elsewhere and whether perpetrated by Iranian forces directly or by associated proxy militias,” he said in a statement while in New York to attend the UN General Assembly. Ruled by Shiite clerics, Iran has a strong influence in Iraq, especially in the country’s Shiite-majority south. Iran’s consulate itself was earlier burned down during the protests, although no one was injured and Tehran quickly opened a new mission. Speaking at the General Assembly, Iranian President Hassan Rouhani also dismissed the US criticism of involvement in its neighbor, questioning why Washington itself was involved in a country so far away. Earlier this month three mortar rounds also hit the fortified Green Zone area in Baghdad, home to the US embassy, without causing injuries and with the perpetrators unclear. Diplomatic security is a key priority for the United States and Pompeo, who as a congressman went on the offensive against former secretary of state Hillary Clinton over a deadly attack on the US consulate in the eastern Libyan city of Benghazi. The Assad regime will use the systems to defend Syria’s coastline and its borders with Israel, Jordan, Lebanon and Iraq, the report said. According to the official, Russia may end up transferring up to eight systems to Syria, depending on the circumstances. 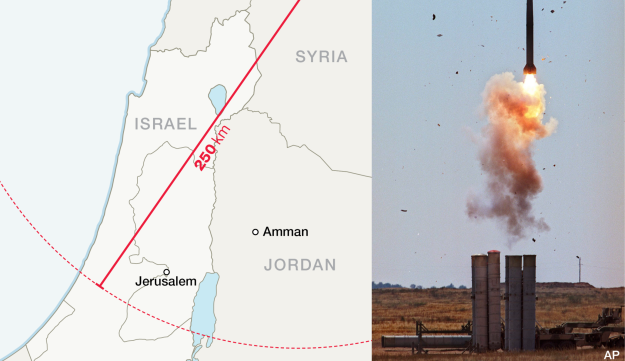 Russia, he said, would also use electronic warfare systems to prevent the activation of satellite tracking systems along Syria’s coast, making it harder for Israel to conduct airstrikes. And Russia will equip Syrian anti-aircraft units with Russian tracking and guidance systems to prevent mishaps in which Syria downs Russian aircraft.Israel’s security cabinet convened Tuesday morning to discuss the diplomatic crisis with Russia ahead of Prime Minister Benjamin Netanyahu’s departure to attend the UN General Assembly session in New York, where he is expected to bring up the row with Russia with U.S. President Donald Trump. Netanyahu discussed the deployment of the S-300s with Putin on Monday. The Prime Minister’s Office said Netanyahu told the Russian president that putting advanced weapons systems in irresponsible hands would increase dangers in the region. Netanyahu added that Israel will continue to protect its security and interests. Netanyahu also reiterated Israel’s position that Syria was responsible for the downing of the plane last week, which killed 15 Russian airmen. The prime minister added that Iran also bore responsibility as it was destabilizing the area. Russia, however, “proceeds from the premise that the actions of the Israeli Air Force were the main cause of the tragedy,” the Kremlin said in a statement after Putin’s phone call with Netanyahu. Putin told Netanyahu that supplying the surface-to-air missile system to the Assad regime is “intended to thwart any potential threat to the lives of the Russian military service members fulfilling the tasks of combatting international terrorism,” the Kremlin said. WASHINGTON (AP) – The president of the United States, Donald Trump, revived the motto ‘America for the Americans’ of the so-called “Monroe Doctrine (1823)” before the General Assembly of the United Nations (UN), ensuring that it will not allow foreign influence on the continent. “Here in the Western Hemisphere we are committed to maintaining our independence from the expansionist spirit of foreign powers,” declared the president of the United States in New York. Referring to the mantra of the so-called Monroe Doctrine that imposed the political and economic desires and whims of Washington in several countries of the continent, Trump pointed out that his government will not allow any other regional influence than the United States. “We are going to reject the interference of foreign nations in this hemisphere and in our affairs. The United States recently strengthened its laws to better scrutinize foreign investments for defense reasons in the face of security threats, “the president said. The UN General Assembly broke into giggles, then outright laughter when US president Donald Trump made a grandiose claim about his administration’s successes. At the beginning of his speech on Tuesday, Trump rolled out a line familiar to White House watchers: “In less than two years, my administration has accomplished more than almost any other administration in history,” he said. “The Chinese government did not approve a request for a port visit to Hong Kong by the USS Wasp. We have a long track record of successful port visits to Hong Kong, and we expect that to continue,” the consulate said. The amphibious assault ship had been due to stop in Hong Kong next month, The Wall Street Journal reported on Tuesday, citing unnamed US military officials. The Chinese foreign ministry declined to comment on the refusal, saying only that China approved port visits on a case-by-case basis. The vessel is part of a group based in Sasebo in Japan and operating in the Indo-Pacific region. In 2016, China denied a request for a US carrier strike group led by the USS John C Stennis to visit Hong Kong during heightened tensions over the South China Sea. This time the rejection comes as China and the United States are locked in a trade war, with the US and then China imposing tariffs on each other’s goods. In New York, Chinese Foreign Minister Wang Yi told a gathering of US business representatives that Washington’s repeated attacks on Beijing threatened the “total destruction” of four decades of gains in China-US relations. Washington also decided last week to impose sanctions on a unit of the Chinese defence ministry and its director for buying advanced weapons from Russia. In response, China recalled a navy commander from a visit to the US and postponed a military dialogue between the two countries. Beijing also summoned US ambassador to China Terry Branstad and acting US defence attaché David Menser to protest against the sanctions. The ministry said the US had no right to interfere in defence cooperation between China and Russia, and the US sanctions had seriously damaged China-US military relations. Beijing has also protested against a US proposal to sell US$330 million in arms to Taiwan. Shen Dingli, an international relations professor at Fudan University in Shanghai, said the rejection was a way for China to express its dissatisfaction. Shen said nationalistic voices would grow resentful if Beijing did not take tough action against the US.